Historic rainfall beginning over the weekend has led to hundreds of road closures, flooded communities and evacuations across the Midwest. 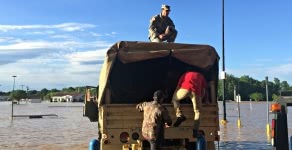 A recent levee failure in Pocahontas, Arkansas prompted a flash flood emergency as massive amounts of water engulfed the streets triggering a mandatory evacuation and putting countless homes and businesses at risk. BELFOR’s local offices throughout the region immediately deployed manpower, water damage cleanup equipment and resources to restore and protect the community from property damage. The BELFOR National Disaster Team has also been deployed to assist in the efforts. With more heavy rainfall in the forecast, BELFOR’s flood restoration experts will continue working around-the-clock to perform water removal services and mobilize those impacted by this catastrophic flooding. We encourage everyone affected to follow local authority recommendations and stay mindful of remaining flood dangers. If you are in need of assistance, BELFOR’s Emergency Hotline is available 24/7 at (800) 856-3333.